Solve the mystery of the Lady Abbess! As far as I can tell, she has hung near the Chapel at Bramall Hall since the late nineteenth century at the very least, and probably much longer. It has been assumed that she is a member of the Davenport family, as all of the portraits that hang in the house are of family members. I need your help to find out a bit more about her. 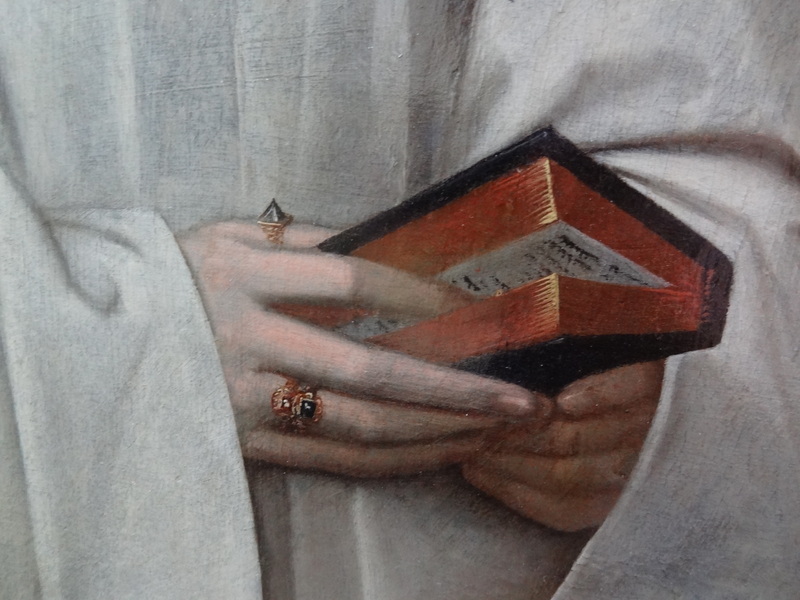 As many of you know, it is impossible that she could have been an English Abbess in 1616 as cloistered communities had been abolished as a result of the Reformation. I have to assume that, in order to pursue her religious vocation, she must have travelled to the continent – probably either France or Spain though this is pure supposition. The family retained a strong association with the Catholic faith following the reformation. William Davenport IV was mentioned in the 1580 State Papers for ‘popery’ and in 1584, his widow Margaret was investigated for recusancy. One of William and Margaret’s sons went on to become a Catholic Priest. 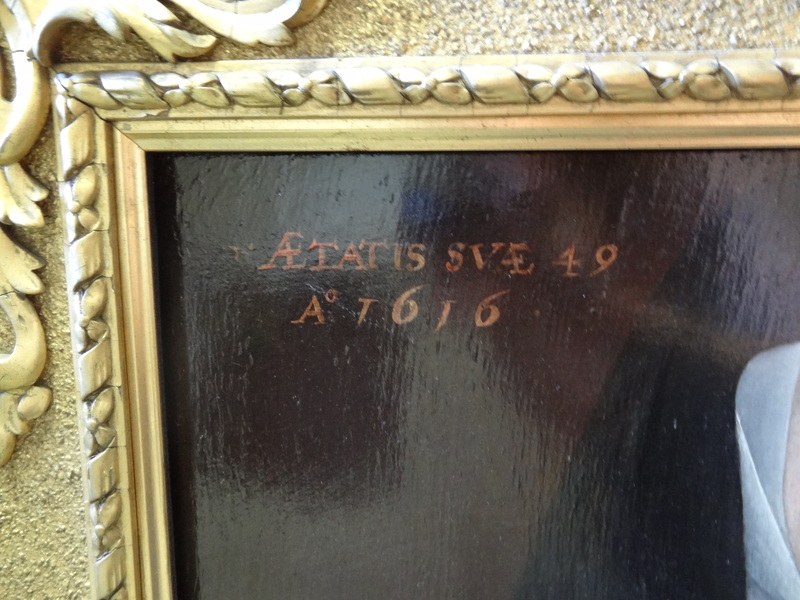 Indeed, the date of the painting suggests that the Lady Abbess could also have been a child of William and Margaret if she was a member of the immediate family. Despite their confessional tendencies, the Davenport family at this time were immensely rich and powerful. 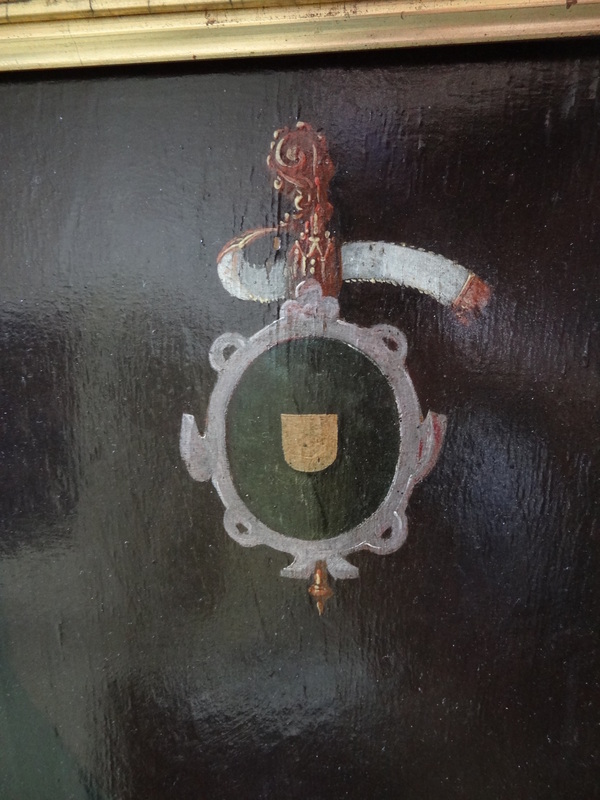 William and Margaret’s eldest son (also William) was knighted by James I in the first few weeks of his reign and served as the High Sheriff of Cheshire. Along with his wife, Dorothy, they threw great parties at Bramall Hall to entertain their similarly rich and powerful friends. I did wonder if the Lady Abbess might, in fact, be a Vowess. Those of you that went to the Social History Society Conference in Portsmouth this year may have heard Laura Wood speak about these wealthy women who managed to both avoid marriage and retain their family lands by taking on a liminal social role. They would take vows of chastity and could live in cloisters, but they did not give up their worldly possessions to the Church, essentially protecting the family lands. Unfortunately, Laura thinks that my Lady Abbess is too late to be a vowess, as the last vow she has researched took place in 1536. So, I am stumped. And annoyed. I want to know who she is! Can you help? Have you seen or heard of anything similar? Does the symbol in the top right of the painting look familiar? Do you recognise her habit? Any and all suggestions are welcome (full credit will, of course, be given!). Reginald Dean, The Davenport Heraldic Tapestry at Bramall Hall, (1955). Barbara Dean, The Story of an Elizabethan Manor House, (Stockport: 1999). so…..what did you find out? Because when I went round the Hall yesterday I was interested to see they have given the Abbess a name: Elizabeth Clifford. I had a go at uncovering the mystery about 20 yrs ago and failed – was it you that found the answer?? Hi Kate. Sorry for my delayed reply – I’ve been away. She was identified by a scholar called James Kelly who has done extensive work on English Catholicism in this period. He based his identification on her habit and the date at which she entered the convent. 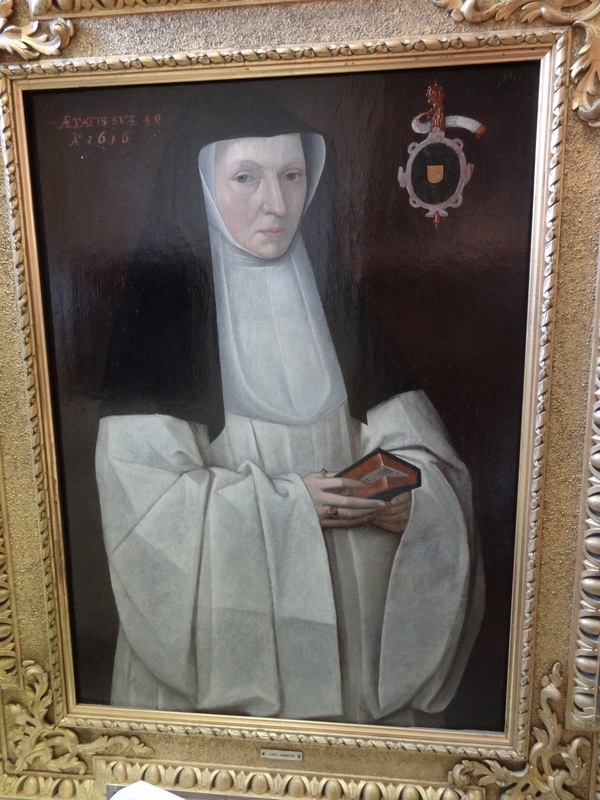 She is also discussed in a book called ‘The English Convents in Exile 1600-1800’ which was published in 2013, edited by James Kelly and Caroline Bowden. I have tried really hard to link her to Bramall but the only suggestion I can come up with is that her sons studied with Davenport sons at the seminaries in Valladolid or Rome. I haven’t been able to find any concrete connection. How did you like refurbished Bramall? I didn’t visit it until about half way through the refurbishment so I don’t know how much has changed (or not!). Thanks Sarah that link is really interesting! I am intrigued by the mystery still – you can imagine all sorts of things that might lead to a family portrait swapping hands. I love all the refurbishments! I had a great time going round and seeing everything looking so immaculate. The new Neville dining room is fantastic and the work on the ceilings and the window glass is so impressive – it was great to watch the video clips. When I worked there the guides used to make preserves in the old fashioned jars for the kitchen (they generally lasted a couple of years then went moldy). Even the moldy ones gave the kitchen a slight ‘in use’ feeling. Everything was amazing with the restoration and the way the stable block has been done is brilliant. Nice to be back to my ”roots” after living and working in South Derbyshire for 22 yrs. Loved the Tudor festival too. Well done for your invovlement you must be very proud. I’m so glad that you enjoyed it! The dining room is fabulous isn’t it – watching the colour matching process on the wallpaper was incredible! My involvement was minimal compared to the curators but it was a fabulous project to be involved in. I have loved it! I will let you know if I ever uncover any more about Elizabeth Clifford and the Davenports!